The government is preparing for the next alien invasion by training child soldiers, and Ender Wiggin is their newest recruit. Six years old, Ender is a genius living in fear of his sadistic older brother Peter. It's only his sister Valentine he'll miss when he's taken away from his family to train at Battle School. He excels and quickly rises to the top of his class, all the while afraid of becoming violent like his brother. Ender doesn't communicate with his family so has no idea that while he's training to fight an alien invasion, Valentine has allied with Peter to manipulate the public and change world politics, making these three children the most influential the world has known. Battle School is incredibly difficult, physically and psychologically. Throughout, all I kept thinking is that Ender's life was no longer his own and never would be. All day and all night, he lived and breathed military strategy and he had no choice. He developed some friendships, but the lives of all these kids were closely controlled to make sure nothing impeded their mission. A great deal of the book described the battle simulations Ender and the other soldiers practiced, and despite the changes to the simulations and improvements Ender made in his skills, I became a little bored before I was even halfway through. But around that time, Valentine and Peter entered the story again as they created fake online profiles with oppositional views and carefully crafted arguments to sway political opinions. I'll admit I didn't understand much about what they were arguing, but I still found this part of the story fascinating. Peter was the stuff of nightmares, as far as older brothers are concerned, but brilliant as a character. Eventually Ender's part of the story became much more interesting as well, and late in the book it became quite gripping. So maybe about 2/5 of the book was pretty boring, with an interesting beginning and end. Some reviews of the book criticize the characters because they don't act like children. This is true - they're all geniuses and completely practical and mature. But it didn't bother me because this is a different world from ours and I don't expect it to be the same. On the other hand, I never felt like I got to know Ender very well. He was definitely a character as opposed to a person, if you know what I mean. Since I'm reading this for my Not-So-Young Adult book group at work, I should probably mention the young adult-ness of it, or lack thereof. Although the readership does span into the teen years, it seems to be a favorite of people of all ages. Despite the age of the protagonist, 6-12 during the course of the book, the writing style is not light or breezy. It's not difficult, but not an easy quick read either. Science fiction and fantasy break age-related bounds in general, and Ender's Game is only young adult the same way that Lord of the Rings is. 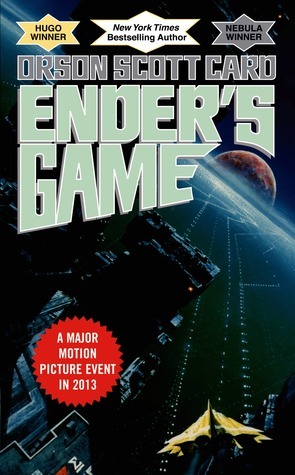 I first read Ender's Game close to 20 years ago, and didn't remember a thing about it except a vague feeling that I had liked it. I'm glad the group voted for it so I had the opportunity to read it again, but it's unlikely I'll continue with the series.